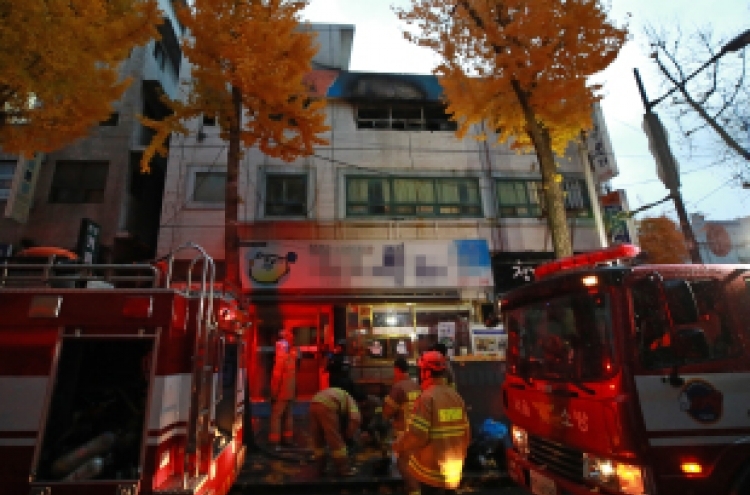 A fire that broke out in low-cost dormitory housing in Jongno, Seoul has left at least seven dead and 10 injured. The fire started from a room in front of the third-floor entrance, trapping residents on the floor behind the fire, the local fire department said. A “gosiwon” is dormitory-style housing facility frequented by students and state-exam takers. The housing is noted for its cheap lodging, and has become popular among day laborers living alone. Most of these low-price housing facilities are located in old buildings. A typical gosiwon has rows of tiny rooms, where one can barely take three steps, on either side of dark, narrow corridors. The rooms mostly consist of a bed and desk, with bathrooms and kitchens shared among residents. Rooms are often illegally modified and lack crucial safety features, making residents vulnerable to accidents such as a fire or building collapse. The three-story building where a fire broke out early Friday morning reportedly did not meet many safety standards. Built in 1983, the facility was not required to undergo special governmental safety checks implemented this year, as it had not been registered as a gosiwon. There were no sprinklers and the corridor was just big enough for an average size full-grown man to walk through. Friday recorded the greatest number of casualties resulting from a fire in a gosiwon in recent years. In 2008, a fire in a gosiwon in Yongin, Gyeonggi Province, left seven people dead and six injured. In October of the same year, six people were killed and seven injured in a gosiwon in Nonhyeon-dong, Seoul, after a resident set his bed on fire and brandished a knife at residents trying to escape. As many gosiwon have been used for cheap housing, the government has since 2002 continuously amended the law related to fire services to ensure disaster prevention features are installed. However, such efforts have largely been unsuccessful. Over the last five years, there have been 252 gosiwon fires. A 2015 government inspection found 2 in 10 gosiwon in central Seoul were particularly vulnerable to disasters.